Hot off the press wire! Piedmont Baseball Foundation, your hometown baseball league, is excited to announce online registration for the Spring 2008 baseball season for ballplayers (girls and boys) from 5 to 14. 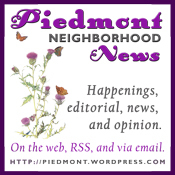 Beginning on Monday, October 15, 2007 through November 6, 2007 Piedmont residents and P.U.S.D. students enjoy priority registration for the Spring 2008 baseball season. Open registration begins on November 6, 2006 and continues through November 25, 2007. All registration is on a space-available basis. To learn more about the Piedmont Baseball Foundation and to register for the Spring 2008 season visit http://www.piedmontbaseball.org/.